With another successful season under our belts and the Division 4 Championship secured, Milden will be competing in Division 3 in 2018, in the Hunts County Suffolk Cricket League. We are trying to secure some dates in February so will update once agreed. Great opportunity to get some practice in, show off your new kit and get the banter going again. Milden Cricket Club - League Champions !!! Milden were crowned Hunts County Division 5 champions by beating Twinstead at their place. First promotion in the clubs recent history and to go the whole season unbeaten is immense. Milden will be celebrating at the end of season awards dinner to be held at The Edwardstone White Horse on 8th October. 7pm meet up. If you wish to attend, please can you contact Captain Tom Konopka (07798822148) or Secretary, Andrew Simmons via the website or facebook. The ground is looking great and the square now been treated, scarified, cut and rolling will begin in the next week or two. Great effort from Andrew Simmons, Richard Harding and Jim Roger-Brown, new addition to Milden Cricket Club. Preparing to be successful for 2016. Pre season nets will be held at Holmwood House School, Chitts Hill, Lexden, Colchester, Essex CO3 9ST, on Sunday 10th and Sunday 17th April between 10am -12 noon. Depending how many turn up, fee is normally 3 pounds. Please can you make every effort to attend. Thanks. Saturday 23rd April, 7.30pm, Boxford School, Milden Cricket Club will be holding a quiz night to swell the coffers of our club. there will be a bar and food for 10 POUNDS per person, teams of six will be permitted for the quiz which Mark Mason will be thinking up some devilishly tough questions. Please can you put the date in your diary now and confirm via facebook if you can attend. Milden Cricket Club will be holding its Annual General Meeting on the 24th November, 8pm at the Edwardstone White Horse. Please can everyone associated with Milden Cricket Club please attend. This is our cricket club and we can make it as successful and enjoyable as we want, but we do need everyone's help. New officers and roles will be voted in as well as discuss plans for the club. Please make every effort to attend. Nets have been picked for the following dates in 2015. We will have two nets available for one hour from 2pm on Sunday's. 22nd March, 29th March, 5th April, 12th April and 19th April. This is your opportunity to meet up with the boys, get prepared for the season to make it the best Milden Cricket Club has ever had !!!!! All players are welcome, even if you have never played for Milden Cricket Club, be a great time to start. 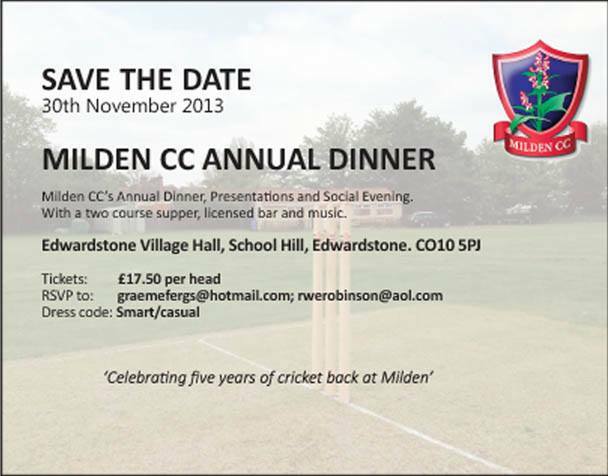 On Saturday 27th September, Milden hosted its annual end of season dinner and awards night at Edwardstone Village Hall. An excellent turnout of people in good cheer surrounded Matt Robinson at the bar, quaffing ample amounts of Victoria Bitter, Staropramen, wine and spirits. Prior to tucking in Martin Roffey delivered the roll call of honours with the following people receiving acknowledgement and silverware. Champagne given to teh following for contribution to the club - Justin Lilley, Scott Hurrel and Alex Cunningham. Well done everyone !!!. The remainder of the evening everyone feasted on a combination of Chicken Curry, Mushroom Stroganoff and Beef Stew, with plenty of rice and poppadums. Once the puddings of cheesecake and chocolate tort had been cleared and raffle finished, everyone got down to the serious business of dancing, I mean really dancing !!! Much refreshment was required during this dance marathon and the final innings of the season finished after 12. Thank you to all those that came and supported the event, helped out with its organisation and sponsorship, and continue to support Milden Cricket Club, it is very much appreciated. Up the Meldes!!! 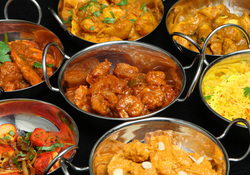 Milden Cricket Club Curry Club -To add a bit of fire and team bonding to Milden CC and following the success of last years night out, we will be having a curry night after nets on Thursday 24th April. We will decide a location nearer the time but likely to be Lavenham or Sudbury with a few beers thrown in. If you would like to attend, please email the club or let us know through our facebook page. The more the merrier !! 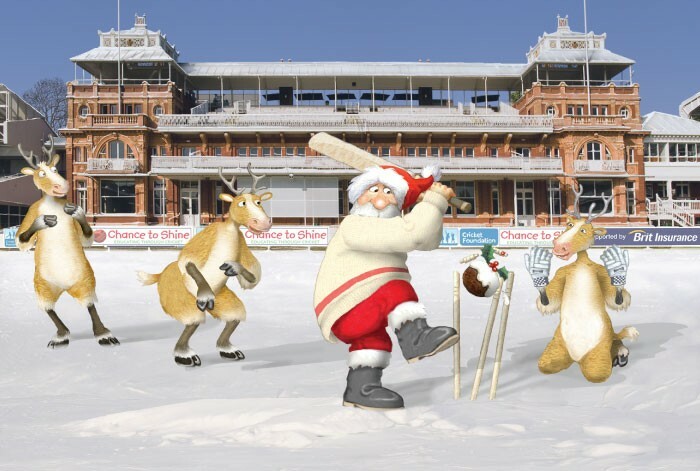 Not long now to the big bash !!!!! The 2013 cricket season is drawing to a close and we have arranged an and of season bash for all players, friends and those associated with Milden CC. This year the presentation evening and dinner will be on Saturday 30th November at Edwardstone Village Hall. There will be good food provided and a bar available. Rumour has it that Skip will be spinning some killer tunes and after last year, much fun and humour will be had by all. Please keep an eye on the Milden CC facebook page for further details but please can you invite as many people as early as possible. Tickets can be purchased from Richard Robinson or requested via Facebook and the cost will be £17.50 which will include a nice meal.